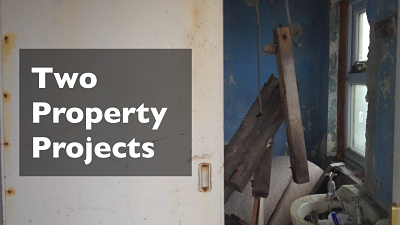 A short video showing two of my upcoming property projects; including the worst bathroom in the world and a special cameo from Rambo the family cat! Hello Blueprint nation! John Wilson here with a quick video postcard from the Isle if Islay. This is where my mum's side of the family comes from; an island off the west coast of Scotland famous for all the whiskies that are made here. Now I wanted to tell you about a couple of property projects that I'm going to be doing over here, so I'll take you up and show you the houses that we're going to be working on. OK so this is "The Anchorage" here, this is the house that has been in the family for, goodness, about 50 years. My parents put a conservatory on it about 15 years ago but as you can see by the downpipes at the side there, it's fallen into a bit of disrepair. We've just had to get the gable end re-rendered and the porch too. We got a new bathroom put in but internally it needs a lot of work so we're going to get that sorted out, to get it to a state where we can let it out as a holiday let so that's going to be an interesting project as I've never done a holiday let before so I look forward to reporting back to you on that. Let's go and have a closer look. Here's the house from the side; as you can see it needs a good paint job. As I say inside it's a bit of a mess, I won't take you inside but the house next to it here, we call it number 22 is really just a shell of a house and has been for about 20-25 years. And this will be the second project, once we have some holiday lets going in The Anchorage then we'll be able to focus attention on this one. My mum put some double glazing into this a few years ago to keep the water out - let's have a look inside. Are you ready for this? Here's the bathroom. What do you think of that? All mod cons! Moving inside. It really just has two rooms, I guess this is the bedroom. It's really just being used as a junk store. There's the ceiling. So the idea is to change it into a one or two bedroom cottage. There's Rambo the cat. Oh look, looks like this is the bedroom, there's the bed. So the idea would be to sort it out downstairs and maybe extend it upwards, I'm not sure if we'd get planning permission to go up the way but certainly out the back, to get a kitchen out the back, maybe an extra bedroom out the back, possibly bedrooms upstairs so you'd have a living room downstairs and one bedroom or maybe another room. So this is Number 22; as you can see, we have our work cut out but I look forward to bringing you more reports on this property and the one next door as the months progress.